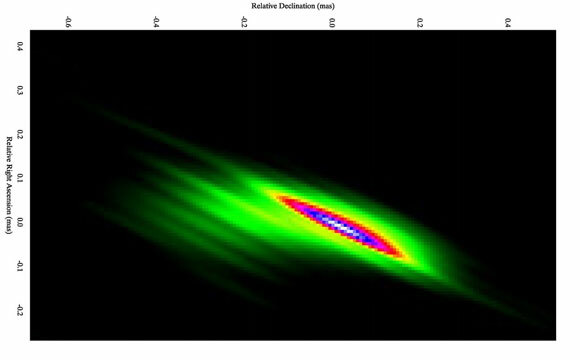 Radio emission from BL Lacertae imaged with RadioAstron at 1.3 cm wavelength at a record angular resolution of 21 microarcseconds. The highly extended orbit of the space radio telescope results in directional dependence of angular resolution, which leads to the apparent elliptical shape of structural details in the image. Astronomers observe microwave radiation from the vicinity of the black hole in the active galactic nucleus known as BL Lacertae, which is 900 million light years. A black hole lurks at the center of the active galaxy in a distance of 900 million light years, known as “BL Lacerta.” Microwave radiation is emitted from the direct vicinity of the black hole. This radiation was the focus of a combination of several radio telescopes, including the radiotelescope Spektr-R, the Effelsberg 100-meter antenna, and another 14 ground-based radio telescopes around the globe. The researchers combined all simultaneously recorded signals from all participating radio telescopes at the special correlator facility operated at the Max Planck Institute for Radio Astronomy in Bonn. This way, a virtual telescope was created with an equivalent size of eight times the Earth’s diameter – yielding the highest resolution image obtained in Astronomy so far. Since 1974, observations with very long baseline interferometry (VLBI) have combined the signals from a cosmic object received at different radio telescopes spread around the globe to synthesize an antenna with the equivalent size of the largest separation between them. This has provided unprecedented sharpness of the images, with over 1000 times better resolution than that of the Hubble Space Telescope in visible light. Now, an international collaboration has broken all records by combining fifteen radio telescopes on Earth and the 10-meter orbiting radio telescope Spektr-R of the RadioAstron mission lead by the Astro Space Center in Moscow. The participation of the Effelsberg 100-meter antenna makes the mission exceptionally sensitive to detecting weak cosmic radio emission. The special analysis (called “correlation”) required to obtain images of cosmic objects from the RadioAstron data is performed at the correlator facility of the Max Planck Institute for Radio Astronomy in Bonn. The investigation of BL Lacertae (BL Lac) provides new insights into the nature of active galaxies, where an extremely massive black hole swallows surrounding matter while simultaneously shooting out a pair of jets of high-energy particles and magnetic fields at nearly light speed. The source is in the direction of the constellation “Lacerta” (the lizard) in the northern sky, in a distance of about nine hundred million light-years from Earth. Observations of microwave radiation are essential for exploring such jets, since high-energy electrons moving in magnetic fields are very proficient at producing microwaves. But most active galaxies with bright jets are billions of light years away from Earth, so their jets are tiny on the sky. High resolution is essential for viewing the jets in action to reveal phenomena like shock waves and turbulence that control how much light is produced at any given time. “The first time combination of ground-based radio telescopes with the space radio telescope of the RadioAstron mission, operating at its maximum resolution, has allowed our team to imitate an antenna with a size of eight times the Earth’s diameter, yielding a resolution of only about twenty microarcseconds,” says José L. Gómez from the Instituto de Astrofísica de Andalucía-CSIC, the leader of the research team. Seen from Earth, twenty microarcseconds correspond to the size of a two euro coin on the Moon; this high resolution probes with unprecedented detail the central regions of BL Lac, an active galactic nucleus which is powered by a supermassive black hole two hundred million times more massive than our Sun. Active galactic nuclei (AGN) are the most energetic objects in the Universe, harboring a giant black hole at the center. Accretion of material toward the black hole leads to the formation of an accretion disk that tightly orbits the black hole, plus a pair of jets of particles shooting out of the nucleus in opposite directions at speeds nearly equal to that of light. For reasons of perspective, you can mostly only see a jet from Earth. “The unprecedented angular resolution provided by RadioAstron reveals a truly unique view of the innermost regions of AGN where most of the energy is produced,” notes Yuri Kovalev from the Astro Space Center, the RadioAstron Project Scientist and a member of the team. Current models suggest that, due to the rotation of the black hole and accretion disk, the magnetic field lines are “twisted” into a spiral structure. Such a coiled field confines the jet to a narrow beam and accelerates its motion. This model is confirmed by the BL Lac observations, which reveal the existence of a large-scale spiral magnetic field in one of the jets. The RadioAstron image also reveals an unusually high intensity of light at the upstream end of BL Lac’s jet not observed before in other AGN. This is making astronomers wonder whether their established ideas on how the jets produce microwave radiation are correct. “In BL Lac, we essentially look into the hottest cosmic hearth which is energizing matter so strongly that it would require achieving temperatures much higher than one trillion degrees, should we have tried to replicate these conditions on Earth,” says Andrei Lobanov from the Max Planck Institute for Radio Astronomy, a co-investigator in the project. “Our current understanding of how the emission is generated in AGN establishes a clear limit on the intensity of microwaves that their cores can produce over long time spans. The extreme intensity observed in BL Lac exceeds that limit, requiring either velocities in the jet even closer to the speed of light than thought before or a revision of our theoretical models,” concludes José L. Gómez. Be the first to comment on "Astronomers Gaze Deep Into the Heart of Active Galaxy BL Lacertae"